April is Jazz Appreciation Month! The West Point Band’s Jazz Knights celebrated it in a big way through partnering with West Point’s academic departments and clubs for several joint events. It was a historic month of “firsts,” with the “first” first being a record set for the number of Jazz Knights-cadet collaborations in a one-month period! I can’t wait to tell you about them, so here they are. Night of the Arts The month-long celebration of jazz began with Night of the Arts or, NOTA, an annual celebration of cadet artistic excellence sponsored by the Department of English and Philosophy. For the first time ever, this year’s NOTA featured a cadet jazz band performance (see photo), with a little help from their friends, the Jazz Knights. The cadets came to the West Point Band building, where I had the opportunity to help rehearse them, and saxophonist Sgt. 1st Class Derrick James and trombonist Staff Sgt. Barry Cooper of the Jazz Knights provided expert coaching to the horn players. At NOTA, the cadets performed the classic Horace Silver piece “Song For My Father,” each taking improvised solos to rousing applause. (I assisted on bass.) As a testament to the historic nature of the performance, the photo in this blog made the Picture of the Week in the Dean’s Significant Activities Report! Sgt. 1st Class Mike Reifenberg opens a window into the world of jazz improvisation for cadets enrolled in English Literature and Philosophy courses. Joining him are Master Sgt. Drewes on drums, Sgt. 1st Class Nelson on bass, and Sgt. 1st Class Tonelli on guitar. Jazz Improvisation Class In four separate presentations to nearly 500 members of the Class of 2017 enrolled in EN102 (Literature) and PY201x (Philosophy), Sgt. 1st Class Mike Reifenberg presented a class entitled Jazz Improvisation: The Art of Spontaneity. It was the final installment in a four-part series requested by Maj. Harry Jones of the Philosophy Department, examining how the arts can be a model for creative problem-solving. Sgt. 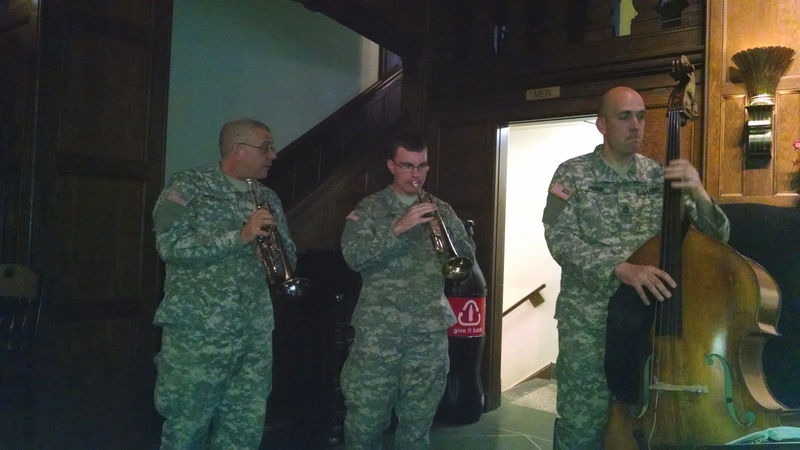 1st Class Reifenberg, on alto saxophone, was joined by a Jazz Knights combo featuring drummer Master Sgt. Scott Drewes, bassist Sgt. 1st Class Brandon Nelson, and me on guitar. Using lecture, live musical demonstration, recordings, visual aids, and much interactive discussion, Sgt. 1st Class Reifenberg opened a window into the intriguing world of jazz improvisation. Cadets got in on the action, too, with a version of “stump the band” in which they chose from a list of jazz songs that the combo previously had not seen. This exercise showed how jazz musicians must use prior knowledge in responding swiftly to unexpected situations. Fortunately, the band came through unscathed, even when one cadet picked John Coltrane’s famously challenging composition “Giant Steps”! In all, the Jazz Knights enjoyed working with the cadets, who walked away from the class with new insights on the skills inherent to jazz improvisation, which they can apply to their own lives and careers. Field trip to NYC One of my favorite additional duties is being the Noncommissioned Officer In Charge of the cadet Jazz Forum Club, a group that, until recently, I didn’t even know existed. But thanks to a phone call a couple of years ago from the club’s former Officer In Charge (OIC), Maj. John Dvorak, the Jazz Forum Club and the Jazz Knights have been joined at the hip ever since. We have done a number of great activities together over the past two years, and we are continuing the tradition. 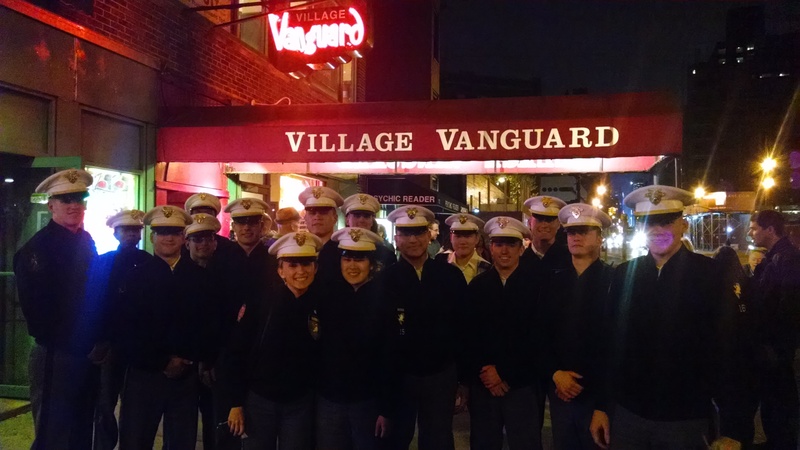 This year, cadets in the club, along with current OIC Maj. Robert Crouse and myself, took a field trip to the jazz mecca of the world, New York City, to immerse ourselves in all things jazz. The day began with a visit to the National Jazz Museum in Harlem. Loren Schoenberg, director of the museum and a well-known jazz saxophonist and educator, presented a private lecture to our group on the importance of jazz in our nation’s history and the role of the museum in promoting jazz. Fittingly, Mr. Schoenberg opened the lecture with his piano performance of the Duke Ellington Orchestra’s theme song, “Take The A Train,” an homage to Harlem, through which the A train runs. He noted that the jazz museum is located in Harlem because of Harlem’s prominent place in jazz history. Mr. Schoenberg indicated that the museum strives to document, preserve, and advance jazz as an original American artform in the same way that baseball and other things uniquely American have a hall of fame. 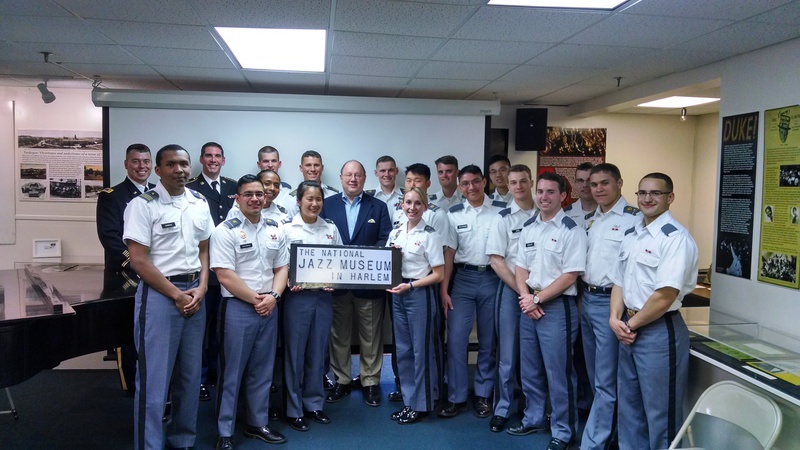 Cadets were able to view the museum’s current exhibit, examine historical jazz memorabilia, and interact with the museum’s highly knowledgeable staff. After visiting the museum, the group headed downtown to Greenwich Village and divided up to sample the eclectic variety of dining choices that “the Village” offers. After dinner, we met up again at the world famous Village Vanguard jazz club to see jazz guitar genius Kurt Rosenwinkel and his quartet. Cadets were able to soak in the unique history of the Vanguard, gazing around the room at the images of jazz’s elite lining the walls, all of whom had set foot in the Vanguard as performers. 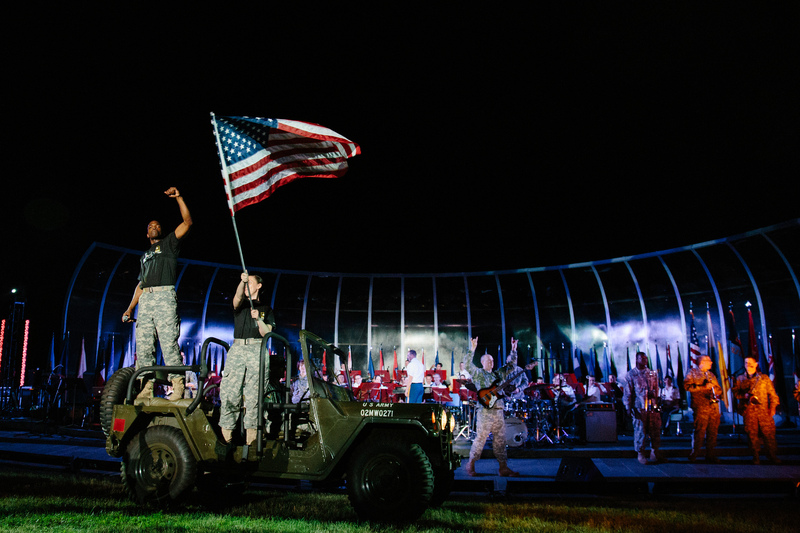 Just before the performance, the Vanguard’s host acknowledged our group and thanked the cadets for their service, which was met with enthusiastic applause from the Vanguard’s patrons. But it was all music after that, as Mr. Rosenwinkel proceeded to dazzle the audience with his brilliant musicianship in a set of all-original compositions. We left the city at 10:30pm– late for cadets, early for jazz musicians– thoroughly inspired by a day of jazz immersion. Jazz at Grant Hall Jazz Appreciation month closed out on a literal high note with a true jazz standard, the jam session, hosted by Grant Hall. The mostly-cadet crowd was treated to a rare evening of live jazz, with a number of their own among the performers. 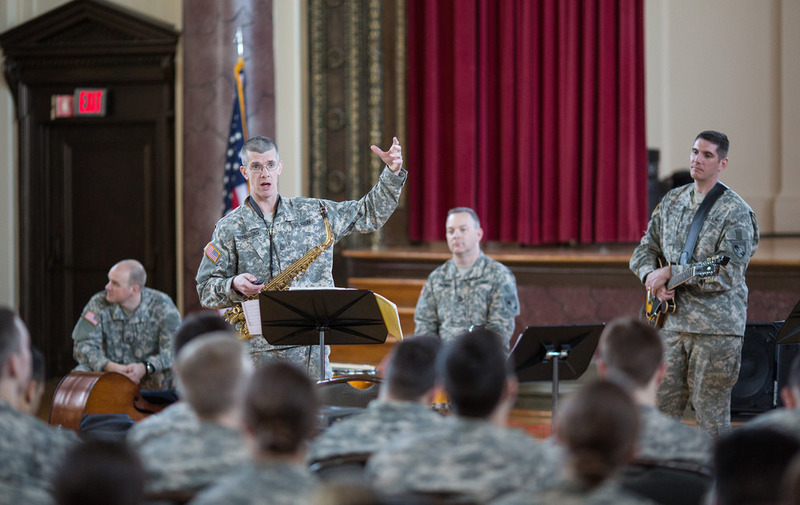 Several cadets brought their “axes” to jam with a Jazz Knights combo consisting of Staff Sgt. Vito Speranza on trumpet, Staff Sgt. Geoff Vidal on tenor saxophone, Master Sgt. Drewes, Sgt. 1st Class Dan Pierce on bass, and me on guitar. Grant’s patrons went wild for the music, and the apparently very educated jazz crowd even applauded after individual solos. A great time was had by all. What a spectacular month. As a jazz musician and educator, I was fortunate to be involved with two things I love doing— performing and teaching jazz. I am grateful to have had the opportunity to share my love of jazz with so many cadets and to help them learn about a world and a life that means so much to me personally. The faces said it all: a satisfied smile for applause on an improvised solo, a look of pride in learning about the importance of jazz in our nation’s heritage, or the dawning of recognition in making a connection about jazz improvisation. And I got to see it all happen in abundance with West Point’s tremendous cadets. In that way, I consider myself a pretty lucky guy. And I look forward to being as lucky in the future as the Jazz Knights continue to partner with West Point’s academic departments and clubs to contribute to cadets’ cultural enrichment through jazz.